Well giddy on up and mosey on down the birthday girl has come to town! What better way to celebrate a birthday than by creating a party that inspires and encourages your little one to learn. My little Kaitlyn loves everything cowgirl. So when choosing her 4th birthday theme it was a real no-brainer. She loves horses, and western wear and especially loves her cowgirl boots. By finding what interests your children have you can build upon their natural curiosity, laying a foundation for early learning. Kaitlyn's natural curiosity about horses has led to several teachable moments, from where they live, what they eat, to how fast they run. We had a real cowgirl party complete with a pony for her little friends to ride. This was such a fun party to create and it really turned out beyond my expectations. I hope you enjoy! 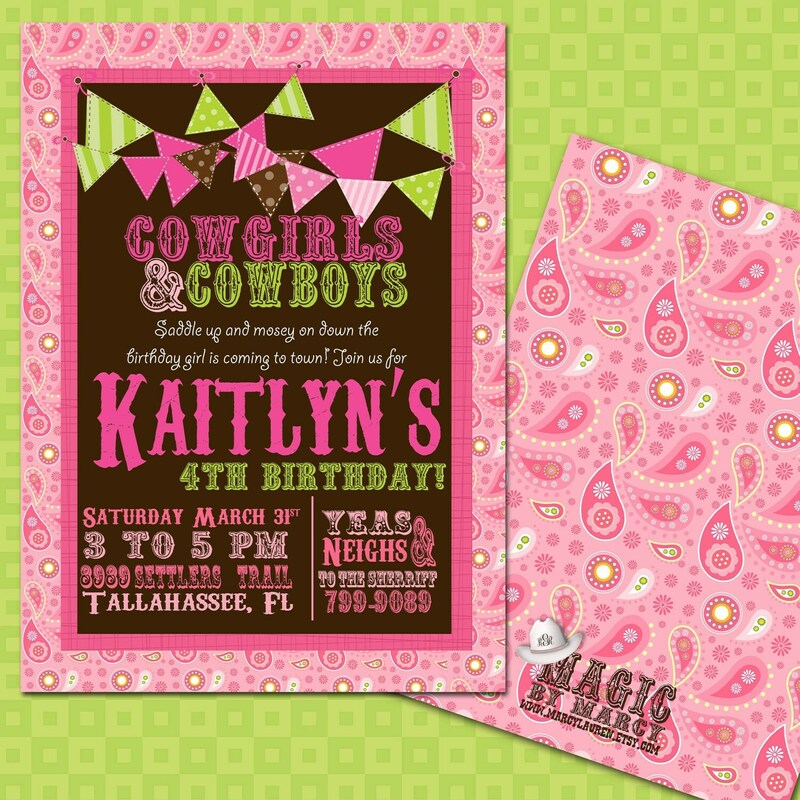 The invitations were my inspiration for this fun cowgirl party. The pink, green and brown were such great colors to use. I especially loved the bandana pint and the pennant banners. I love printing this design onto linen paper at www.mpix.com. They have stunning quality! We had a southern favorite Cowgirl cocktails, a small styrofoam cup filled with baked beans, coleslaw, and topped with smoked pulled pork....yum yum yum! My mouth is watering already. Small paper bags were the perfect fit for our mini grilled cheese star sandwiches. They are so easy to make and are a great crowd pleaser for the little ones. Just take white bread and add your favorite sliced cheese. Use a star cookie cutter to cut out a star. Place on a panini press for just a few seconds and then place in bags, add a sticker for a special added touch.....as you can see I had a hard time getting my stickers to align correctly in the printer...technology!!! But I think they turned out pretty darn cute despite the white border. I used individual cups ( found at walmart for just 2.59) for the Ranch dressing. Small slices of carrots, zucchini, and squash were placed in pink and brown polka dot cups. I also found these at walmart, they were perfect for our decor. What's a cowgirl party without S'mores. These were a definite hit with the kiddos. Just take a strawberry marshmallow and place on a graham cracker, heat in the microwave for a few seconds. Add a graham cracker top, dip into melted chocolate and add your favorite colored sprinkles. These are a great no mess solution to making s'mores....they will definitely leave your little cowgirls &amp; cowboys wanting some more! I added folded food labels to help with the food. These help to add a special colorful touch to your food table. Pretzel sticks were used as hay. The watering trough.....pink lemonade in mason jars and root beers on ice. Custom root beer bottle labels are so easy to make you can purchase a custom design from Magic By Marcy and then just print onto cardstock on your home printer or at your local office supply shop. Use clear packing tape to apply onto bottle. If you need them to go in a cooler just add clear packing tape across the entire piece of paper. Picking a few colors and sticking to a theme help to make any party pop! I used pink green and brown with country cowgirl accents. I used lots of metal buckets for a rustic feel as well as natural fibers like chocolate brown burlap as table runners. I also used twine to tie to the balloons and 3 bales of hay to decorate our watering trough area. Fresh sunflowers added a special touch to the tables. I used pink, green and brown coordinating fabrics to make pennant banners for the tables. These are so easy to sew and take just an hour or so to make. If you aren't up for the sewing pinking shears and tron on hemming tape will do the job. Just cut out your pennants with the pinking shears and use the iron on hemming tape to adhere the pennants to your favorite ribbon. For the cake I used my favorite cake designer Miss Marilyn. My local Tallahassee friends know how much I enjoy her work. She takes the invitations I design and makes them come to life with the cake. Each design is truly a work of art! For the cake topper we found a number 4 at our local Hobby lobby for just a few dollars and I used twine to wrap around it to give it a more rustic feel. The cake was strawberry, my little cowgirl's request. With cream cheese icing....and ohh was it yummy! We also had a few marshmallow pops...these might just be the easiest dessert for your table. Just take marshmallows ( we used strawberry of course) and add a stick, dip into melted chocolate and add sprinkles, let dry and then serve. For favors I used iced flower cookies on a stick. I found these at my local Dollar tree....yes your heard me my Dollar tree. I took them out of the package and added them to my own cellophane treat bag. I added some ribbon and a custom Thank you tag. They were very delicious and the best part they were only $1! Kaitlyn's cowgirl outfit was made using fabric scraps for her skirt. I just took some elastic and tied fabric scraps onto the waistline. I layered it with her bright pink tutu. They were fabulous to work with I went in and chose my design, customized my fabrics and picked it up two days later. It was a perfect touch for her party! My little cowgirl had a great time celebrating with all of her friends. This will be a birthday I am sure she will never forget! Cute cowgirl party! We had "a little ranch" for one of our snacks too at our western themed party that will be featured in Tallahassee Woman magazine. So fun!